Seeking to augment and consolidate his disconnected territories, Frederick William (“the Great Elector”) (r. 1640-88), joined a number of alliances with European powers, shifting between Poland and Sweden in the Baltic arena and France and the Austrian Habsburgs in the central European theater. He secured Eastern Pomerania at the Peace of Westphalia (1648), and later gained international recognition of his claim to sovereignty in Prussia in the First Northern War (1655-60) by withdrawing from alliance with Sweden and siding with Poland. In 1674, Frederick William joined the Empire’s war against France (i.e., the Dutch War), whereupon France’s Swedish allies invaded Brandenburg from their Western Pomeranian bases. On this cue, Frederick William pursued his goal of acquiring (Swedish) Western Pomerania. In 1675, he defeated the Swedes at Fehrbellin and pushed on to the Baltic Sea. This image shows the Great Elector’s siege of Stettin (Szczecin, Western Pomerania, today Poland) in the winter of 1677-78. After the fall of Stettin, he pursued Swedish troops all the way to Riga (now in Latvia), clearing the way for his occupation of Western Pomerania. 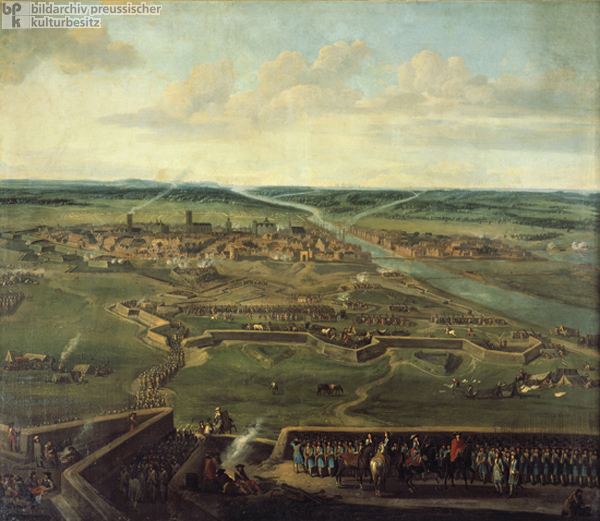 The Peace of Nijmegen (1678/79) prevented Frederick William from acquiring Pomeranian territory from the Swedes, demonstrating that Brandenburg-Prussia remained, in the end, a secondary power dependent on the patronage of the great powers of the day. Oil on canvas by Jan van Huchtenburgh (1647-1733), c. 1680.